One of my favorite Japanese restaurants that I frequented with my best college friends had to be Osakaya. I probably went there at least once a week! Located in Kinokuniya Building in Japantown, I remember catching the 38 bus and jumping off at Laguna ready to eat some damn good food! "No more Caf food!" I'd say in my head. Haha. Having only 2 short days in SF, I knew I had to make it down to Osakaya.....and that I did. Ordering my usual lunch special, Unagi and Yakiniku Beef combo, I was completely and utterly satisfied. If you're not there for lunch, they also have other great dinner specials plus nigiri sushi and rolls. One of my favorite appetizers is their Soft Shell Crab. Highly recommended, and for only $7! Squeeze some lemon over it, and you're good to go! Don't forget Sophie's for dessert though! Btw, what's funny- I recognized the waitresses! Even they hadn't changed, and were still working there. Funny how some things still stay the same...and others change dramatically. Head down here for some great lunch specials! Combos are huge and will definitely fill you up. Yakiniku Beef and Unagi Combo- I can't get enough of the Yakiniku Beef. So thin and flavorful and not too fatty. Plus, look how much they give you! 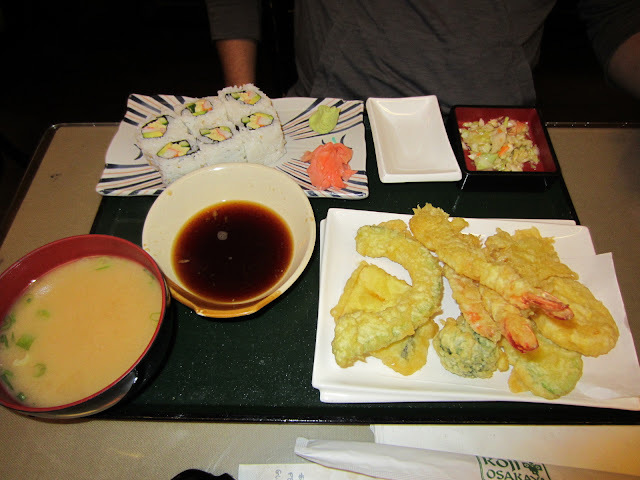 BFF, Nick, had their Tempura dish!